As I was cleaning my kitchen last week, I noticed my Jesus plate tucked away in a corner of my kitchen. I leave it out all year and it is visible, but I thought to myself, "Why is Jesus in the corner, especially at Christmas?!" Carefully I pulled Jesus out of the corner. He was dusty. 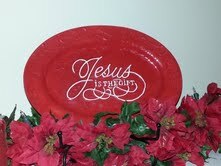 I gave the Jesus plate a good run under the kitchen sink faucet and wiped the dust from the exterior ceramic. This plate deserves a better location than the corner! Jesus deserves to be center stage. I found the perfect spot for Him. He is now sitting front and center on top of my fireplace mantle. So much better than in the corner collecting dust! Where is Jesus in your home? Is He sitting in some corner collecting dust or is He front and center? Do you only get Jesus out at Christmas and leave Him alone tucked away the rest of the year? If your Bible has dust on it, it is time to get it out, blow it off, and open it. When the Word of God is collecting dust in our homes, it is a sure sign that our hearts are collecting dust as well. With the business of the season, it is easy to be about husseling and busseling while keeping Jesus tucked away, forgotten. Christmas is all about Jesus. Let's not keep him tucked away in a corner. Let's display Him for all to see! He makes all things beautiful (even a mantle!). My mantle seemed void of something until I added Jesus. Jesus completed the mantle. Likewise, Jesus completes me. I need Jesus! My life was void of something until Jesus. I was in a corner collecting dust (and dirt, grime, filth, etc.). When Jesus found me, He dusted me off, ran me under the faucet of His cleansing blood and wiped away all the dirt. Then He displayed me proudly for all to see. He calls us a display of His splendor (Isaiah 61:3). I want to display His beauty, not keep it hidden. His beauty goes unnoticed when tucked away in some corner. We need to display Him proudly and boldly proclaim the gospel of Jesus Christ. Not just at Christmas, but everyday let's keep Him front and center and not in some corner collecting dust. Let's keep Jesus free of dust so our lives can also be dust free and glorify Him! Dear Heavenly Father, forgive me for times I have kept you in some corner of my life. Forgive me for times I have let you collect dust. I need you each and everyday. I need you to come and cleanse me of my dust, dirt and sins. Cleanse my heart, oh God and renew a right spirit within me (Ps 51:10). My life is empty without you. Help me keep You the center of my life. I pray that as I keep you in the center, my life would glorify you. Thank you for the gift of Your precious Son, Jesus. Keep my heart steadfast on Him. In Jesus name, Amen. "Now faith is the substance of things of things hoped for, the evidence of things not seen." Let's break this verse down today. "Faith" comes from the Greek word pistis. It means "belief, confidence in God, or assurance". Faith is having full confidence in God. It is being assured that He will do what He said He will do. Sometimes we don't pay much attention to the little words like "is", but "is" is an important little word! "Is" comes from the Greek word "esti" and means "to be present, to happen". Faith is present. Faith is a noun. It is active and alive in our lives. "Substance" comes from the Greek word hypostasis. It means "that which has a foundation, is firm, real being (actual existence)". It also can mean "confidence, firm trust, assurance". Faith is a real being and is the foundation of all we believe. It is our confidence. "Of things hoped for" is translated from the Greek word elpizo. It means "hope or to wait with joy and full confidence". We can wait with joy and confidence KNOWING our God will do what He has promised to do. "Evidence" is from the Greek word elegchos. It means "proof". "Things" is from the Greek word pragma. It means "that which has been done, an accomplished fact, that which exists." "Faith is the substance of things hoped for, the evidence"... The evidence will show that what we are hoping for (or waiting for with confidence) has been accomplished. When there is a crime and a mystery needs to be solved. The detectives search for evidence or proof that a crime was committed. The proof is found by the eyes. When the proof is found, then they know what happened. It already has happened, the truth was there all along. It was already done. Faith is the same way. What we are believing for is already done, our faith will bring it out in the open for us to see. It becomes our proof of that which we cannot see has actually already been accomplished. What we are believing for already exists! "Seen" means "to see" (nothing too deep there). I hope the study of this verse helps you to see we not only can have confidence that God will do what He says He will do, but even better than that...God has ALREADY done it! We just cannot see it yet. That is the confidence we can have! We can have God-fidence!! Last night while our seven year old son, Luke, was going to bed, he was crying because he had done something wrong. I asked him why he was crying, and he explained, "I am not good or bad, I am just right." Now, I have to tell you I didn't have the foggiest clue what he was talking about. Baffled, I questioned, "What do you mean, you are 'just right'?" He then went on the explain (in a "Mom, I can't believe you don't know about the three bears" tone of voice), "You know, the three bears...one was too hot, one was too cold and one was 'just right'. I am just right." (How silly of me, of course, the three bears!) I pondered this seven year old's view of himself for a moment and then without another hint of hesitation, I poignantly addressed this issue. Many people may view themselves as Luke did, as "just right". They may say it a little differently like, "I'm doing ok" or "I'm alright just the way I am." "Just right" connotes average, in the middle, or mediocre. We. Are. More. We are more than conquerors in Christ Jesus ( Romans 8:37). By Christ, we have been made kings and priests to His God and Father (Rev 1:6). We are holy brethren, partakers of the heavenly calling (Hebrews 3:1). In Revelations 3:15, it is written, "I know your works, that you are neither cold nor hot. I could wish you were cold or hot. So then, because you are lukewarm and neither cold nor hot, I will vomit you out of My mouth." God wants us to be cold or hot, not "just right". In my Bible commentary, it further explains that cold springs are refreshing and hot mineral springs have medicinal properties. Lukewarmness is nauseating. We are not to adapt to the low to mediocre standards of the world. Stir up your zeal for the Lord and don't settle for "just right". Sorry Luke...even though your name is Luke, I will NOT let you settle for luke-warm. You were made for more my son! This is week two for the online Bible study with Melissa Taylor's Online Bible Studies. We are reading Greater by Pastor Steven Furtick. This week we read about Elisha and how God called him to "greater" when the prophet Elijiah stopped by while he was out plowing one day. To read more about Elisha, go to 1 Kings 19:19-21, 2 Kings 2:1-9:13, 2 Kings 13:14-21. Elisha knew the Lord was calling Him "greater'. He knew he was about to switch from the fields of plowing to the field of the prophetic. It would seem a "no brainer" for him. The man of God shows up and of course you follow. However, we don't always have a prophet come and throw a mantle on us when God is calling us to "greater". In 1999, my husband and I sensed the Lord calling us to move from Illinois to Tennessee. My husband, Chris, had a great job with a fortune 500 company and was on the fast track to "success" by the world's standards. My entire family lives in Illinois. A move meant quitting our jobs and leaving our family and friends to go to a new place. Fear struck my heart as we made this decision. What if we fail? What if this is a big mistake? What if we lose everything? I remember laying prostrate on my bed crying before the Lord. Father, please give me peace...how do we know this is you? Please Lord, I need to know...I need You to speak to me. Then, I opened my devotional hoping for a Word, hoping the Lord would speak. He did. It was a devotional a friend had given me. It had been hers and she passed it on to me. I opened it to a page and on that page one sentence was underlined. (It was the ONLY sentence underlined in the whole book.) It is a sentence I will NEVER forget. "Do not be afraid you will lose everything. God is your source, not the world." Even now as I write this I am tearing up. Immediately I knew the Lord was speaking to me. I won't say this word from the Lord necessarily made it easy to leave. However, it did make it clear this move was Him and that He was with us. I am always wanting the booming voice from Heaven telling me exactly what to do, but lets face reality...even a booming voice doesn't always make it easy to follow the Lord. Remember Moses? He had a burning bush! Even with a burning bush and the booming voice he wrestled with what God was calling him to do. Following God may not always be easy, but it is always worth the cost. I would rather be uncomfortable and in His perfect will than comfortable outside of it. The Lord will show you His will if you ask. He will reveal the next step to take. He won't leave you guessing. We left Illinois thirteen years ago and it was definitely the Lord. I am amazed at all the Lord has done in these thirteen years. We didn't lose everything. God proved He is our source. He has done above and beyond anything we could ask or think! We may not get a burning bush or a prophet throwing a mantle on us when God calls us to something greater (although that would be nice). However the Lord speaks, I pray that we would respond as Elisha responded. I pray we would take off running in the direction of the greater life God has planned for us!